You'd probably find it difficult to locate anyone, teacher or non-teacher, who doesn't recognize that there's some sort of a relationship between teaching and testing. Just about everyone realizes that if a teacher does a great instructional job, that teacher's students will usu-ally perform better on tests. It's the other side of the equation that's less often understood, namely, that how a teacher tests—the way a teacher designs tests and applies test data—can profoundly affect how well that teacher teaches. The connection between one's teaching and one's testing is a crit-ical one that, if properly understood, can lead to a substantial increase in instructional effectiveness. I want you not only to accept the idea that testing can help teaching, but also to act on that idea. I want you to pick up tangible instructional payoffs from linking your tests to your teaching. You'll teach better, and your students will learn more. You'll be a better teacher, and I'll be a happy author. Let's get started. I need to define some terms as we get under way. First, what is a test or, more specifically, what is an educational test? Simply put, an educational test is a formal attempt to determine a student's status with respect to specific variables, such as the student's knowledge, skills, and attitudes. The adjective “formal” in the previous sentence is important, because it distinguishes a test from the many casual judgments that teachers routinely make about their students. For example, during my first year of teaching (in a small eastern Oregon high school), I had a student named Mary Ruth Green. I could almost always tell (or so I thought) how well Mary Ruth had mastered the previous night's English homework assignment. When it came time to discuss the homework topic, if Mary Ruth was animated and eager to contribute, I concluded that she knew the assigned stuff. If she sat silently and avoided eye contact with me, however, I guessed that she and the previous night's homework topic were unacquainted. I made all sorts of on-the-spot judgments about what Mary Ruth and my other students knew, but those judgments were informal ones and often based on pretty skimpy observational data. In contrast, a test entails a systematic effort to get a fix on a student's status with respect to such things as the student's ability to perform an intellectual skill—to compose a job-application letter, for instance, or to carry out an hypothesis-testing experiment in a chemistry class. For many people, the word test conjures up images of traditional, paper-and-pencil forms (multiple-choice exams or True-False quizzes). Perhaps this explains why a growing number of educators prefer to use the term assessment, which seems to embrace both traditional forms of testing and comparatively recent ones like looking for evidence of learning by examining student-generated work portfolios or group reports of experimental projects. Still, as long as you don't restrict yourself to only traditional testing approaches, the terms test and assessment are really interchangeable. And while we're swimming in this particular synonym pool, let me toss in two more: the slightly technical-sounding measurement and the serious-sounding examination (or exam). Each of these four terms describes a formal attempt to determine a student's status with respect to an educationally relevant variable. In this book, you'll find that I use all four interchangeably, not for any subtle reasons, but just because I get tired of using the same word all the time. Human beings are tough to figure out. Ask any psychiatrist. Ask yourself. And young human beings in grades K-12 are no exception. To illustrate, if a teacher wants to determine what Ted's ability to read is, the teacher won't find that information tattooed on Ted's arm. Ted's reading ability is covert. The teacher must figure out how to uncover that hidden ability. So the teacher whips up a 15-item reading test calling for Ted to read several short passages and then answer a series of questions getting at (1) the central messages in the passages and (2) certain key details in those passages. Ted takes the test and does a great job, answering each of the 15 items correctly. The teacher then makes an inference about Ted's covert reading ability based on Ted's overt performance on the 15-item test. Martha did well on this month's spelling test. She wrote out “from scratch” the correct spellings for 18 of 20 words I read out loud. It is reasonable for me to infer, then, that Martha possesses a really high level of spelling ability—a level of ability that would display itself in a fairly similar fashion if Martha were asked to take other, similar 20-item spelling tests. Remember, what the teacher sees when Martha spells the word “awry” properly is only Martha's spelling of “awry” and not Martha's spelling ability. The teacher needs to infer the level of Martha's spelling skill by seeing how well Martha does on her spelling tests. The more spelling tests that Martha takes, the more confidence the teacher can have in any inferences about Martha's spelling skill. An inference about a student can be based on a single test; a more accurate inference will be made if multiple tests are employed. So educational measurement is, at bottom, an inference-making enterprise in which we formally collect overt, test-based evidence from students to arrive at what we hope are accurate inferences about students' status with respect to covert, educationally important variables: reading ability, knowledge of history, ability to solve simultaneous equations, interest in social studies, and so on. The process is represented in Figure 1.1. Yes, as my experience with Mary Ruth and her homework showed, it is certainly possible for a teacher to make an inference about students based on informal, nontest evidence. Suppose your student Alvin gives you a note in which he had misspelled several words. Based on this evidence, you might infer that Alvin's spelling ability isn't all that wonderful. However, a formal assessment of Alvin's spelling skill, one based on a larger and more age-appropriate set of words, would increase the likelihood of your making an accurate inference about Alvin's spelling ability. The accuracy of these inferences is critical, because a teacher's understanding of students' knowledge, abilities, and attitudes should form the basis for the teacher's instructional decisions. And, of course, the more accurate the test-based inferences a teacher makes, the more defensible will be the teacher's instructional decisions based on those inferences. What Sorts of Teaching Decisions Can Tests Help? 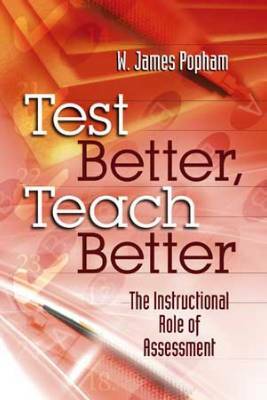 I've been touting the tight relationship that should be present between testing and teaching. It's time to get more specific. There are four types of teaching decisions that should rest squarely on what a teacher finds out either from the structure of the educational tests themselves or from the way students perform on educational tests. Now, let's take a closer look at how tests—both their design and the results of their application—can help teachers make these kinds of decisions with confidence. Typically, educators think of a curriculum as the set of intended outcomes that we want students to achieve. During the bulk of my teaching career, most teachers have used the phrase educational objectives to describe their curricular intentions. These days, of course, we find that most curricula are described as sets of content standards—that is, the knowledge and skills students are supposed to master as a consequence of instruction. Sometimes we see the term benchmarks used to describe the more specific skills and knowledge often subsumed beneath fairly broad content standards. The descriptors may change, but the mission of a curriculum remains constant: Its essential purpose is to lay out the stuff we want kids to learn. Let's imagine you're one of the 5th grade teachers who is supposed to help students master this content standard. How would you go about planning your instruction? Personally, I think there's way too much fuzz on this curricular peach. Different teachers could easily read this social studies content standard and come up with quite divergent ideas of what it signifies. For example, one teacher might conclude that this content standard focuses exclusively on the formal and informal “checks and balances” when one governmental branch interacts with the other two. Another teacher might think that this content standard emphasizes the distinction between “formal” and “informal” interrelationships among the three governmental branches. Now suppose that your 5th graders will be taking an important “standards-based” social studies achievement test at the end of the school year. If the people who built that test interpret this social studies content standard in one way, and you interpret it in another way—and teach toward your interpretation—it's almost certain that your students won't do as well on the achievement test as you, your principal, or your students' parents would like. Clearly, if the curricular aims that a teacher must address are open to multiple interpretations, then off-the-mark instruction is likely to occur, bringing with it lower test performances. But if a curricular goal is accompanied by a set of illustrative test items indicating the ways that the goal will be measured, then teachers can analyze those items and form a far more accurate idea of the outcome that the state or district is actually seeking. Because the sample test items exemplify what the curricular intention really represents, teachers can plan and provide their students with better, more curricularly relevant instruction. Which of the following three branches of U.S. government, if any, is primarily responsible for the final enactment of treaties with foreign nations? No single branch is responsible. The enactment of term-limiting legislation at the local level has made the U.S. federal legislative branch of government more stable. The availability of the impeachment process tends to decrease the stability of the executive branch of U.S. government. Historically, the judicial branch of U.S. federal government has been the most stable. Our founding fathers charted a meaningful series of governmental checks and balances. Focus on the area of taxation, then select two of the three branches and briefly describe the formal way(s) in which one branch can check the other. Answer in the space provided below. Having read these sample items, wouldn't you have a much better idea of what to teach your students in order for them to come to “comprehend the formal and informal nature of the interrelationships among the executive, legislative, and judicial branches of U.S. government”? Sample Item 1 makes it clear that students will need to learn the primary responsibilities of each governmental branch. Sample Item 2 suggests that students must learn why important factors such as governmental stability are present for each branch. And Sample Item 3 indicates that, as the content standard said, students will need to understand the “formal and informal nature of the relationships” among the governmental branches. For this item, as you can see, the focus is on formal. In another item, you can reasonably assume, the focus might be on informal. Moreover, Sample Item 3 tips you off that students may need to display this understanding by constructing their own responses, rather than merely selecting a response from a set of options. I believe that elementary teachers who consider these three illustrative items along with the original statement of the content standard are going to have a far more lucid idea of what the content standard actually means. Consequently, they'll be able to deliver instruction that is more on-target and more effective. The payoffs from test-triggered clarity about curriculum goals can apply with equal force to a teacher's own, personally chosen curricular aspirations. If teachers are pursuing curricular aims of their own choosing, but those aims are less clear (in a teacher's mind) than is desirable for instructional planning purposes, then teachers are likely to come up with less relevant instruction. To illustrate, when I was a first-year teacher, I wanted the students in my two English classes “to be better writers.” But even though that very general goal was in my mind as the school year got under way, I really had no idea of what it meant for my students to be “better writers.” As the months went by, I occasionally had my students write a practice essay. However, for their final exam, I had them answer multiple-choice items about the mechanics of writing. Shame on me! The task of creating a few sample assessment items can bring the desired outcomes into focus. In short, test-exemplified curricular goals will almost always be better promoted instructionally than will unexemplified curricular goals. Because of the significance of tests in helping teachers clarify their instructional targets, I'm going to dig into this topic a bit more deeply in Chapter 2. Stay tuned. In most instructional settings, teachers inherit a new crop of students each year, and more often than not, these teachers really don't know what sorts of capabilities the new students bring with them. Likewise, teachers looking ahead in their planning books to new topics or skills (weather systems, Homer's epics, multiplying fractions, group discussion skills, ability to work independently) frequently find they have only the roughest idea, usually based on the previous grade level's content standards, of their students' existing familiarity or interest in the upcoming topics or of their students' expertise in the upcoming skill areas. Knowing where students stand in relation to future content, both as a group and as individuals, is one of a teacher's most valuable tools in planning appropriate and engaging instruction. Therefore, it's an eminently sensible thing for teachers to get a fix on their students' entry status by pre-assessing them, usually using teacher-created tests to find out what sorts of skills, knowledge, or attitudes these students have. The more diagnostic a pretest is, the more illuminating it will be to the teacher. You can use pretests to isolate the things your new students already know as well as the things you will need to teach them. If you are a middle school English teacher aspiring to have your 8th graders write gripping narrative essays, and you're certain that these 8th graders haven't seriously studied narrative essays during their earlier years in school, you could use a pre-assessment to help you determine whether your students possess important enabling subskills. Can they, for example, write sentences and paragraphs largely free of mechanical errors in spelling, punctuation, and word usage? If their pre-assessment results show that they already possess these enabling subskills, there's no need to re-teach such subskills. If the pre-assessment results show that your students' mastery of the mechanics of writing is modest, then you'll need to devote appropriate time to promoting such subskills before you move on. One of the classes I taught in my early years on the “grown-up” side of the desk was 10th grade geography. Thanks to a blessed red geography textbook and my ability to read more rapidly than my 10th graders, I survived the experience (barely). I remember that one of my units was three-week focus on map projections and map skills, during which we explored the use of such map-types as Mercator and homolographic projections. Each year that I taught 10th grade geography, my three-week unit on maps was always precisely three weeks in length. I never altered the duration of the unit because, after all, I had originally estimated that it would take 15 days of teaching to stuff the designated content into my students' heads. Yes, I was instructionally naïve. Beginning teachers often are. What I should have done instead was use some sort of “dipstick” assessment of students' map skills throughout that three-week period to give me a better idea of how long I really needed to keep teaching map skills to my 10th graders. I always gave my students a 30-item map skills exam at the end of the 3 weeks; I could easily have taken that exam and split it up into 15 microquizzes of 1 or 2 items each, and then randomly administered each of those microquizzes to different students at the end of, say, 2 weeks. Students would have needed only two or three minutes to complete their microquizzes. This approach is a form of what's called item sampling, a manner of testing in which different students are asked to complete different subsamples of items from a test. It works quite well if a teacher is trying to get a fix on the status of an entire class. (Clearly, item sampling wouldn't permit sensible inferences about individual students because different students would be completing different microquizzes.) By reviewing the results of my item-sampled, en route assessment, I could have determined whether, at the end of only two weeks, my students had already learned enough from their meanderings through Mapland. Looking back, I suspect, we continued to mess with Mercators and homolographics well beyond what was necessary. You can do something similar with your own students to help you decide how long to continue teaching toward a particular content standard. By using an occasional en route test (either item sampling or by giving the same, possibly shortened, test to all of your students), you can tell whether you need to keep banging away on a topic or can put your drumsticks away. This kind of instructionally illuminating testing, sometimes referred to as formative assessment, is a particularly valuable tool today, when there's so much to fit into each school year. The time saved in an easily mastered unit can be time applied to other material that students have unexpected difficulty with. Flexible, en route test-guided instructional scheduling can allow your students to move on to fascinating application activities or delve more deeply into other content. The issue of how well a teacher has taught is becoming more and more critical as the educational accountability movement places teachers under ever-intensifying scrutiny. The folks who are demanding evidence that teachers are doing a solid instructional job are looking for hard evidence that proves instructional effectiveness. This is such a serious and complicated assessment-related issue that I've devoted three chapters in this book to it. Chapter 9 explores how not to evaluate a teacher's effectiveness; Chapters 10 and 11 tell how to go about it properly. But, because finding out how effective your own instruction is should be important to you, I need to address some important assessment-related topics first. These days, many teachers' instructional competence is being determined on the basis of a single achievement test administered to students each spring. For instance, a 4th grade teacher's students complete a state-approved standardized achievement test in May, and then the test results of this year's 4th graders are compared with the test results of last year's 4th graders. If this year's scores are better than last year's scores, the 4th grade teacher is thought to be doing a good instructional job . . . and vice versa. But this sort of teacher-appraisal model flunks on several counts. For one thing, it relies on the wrong kind of measurement tool, as you'll learn when you get to Chapter 9. And there's another, more obvious shortcoming in these year-to-year comparison models. The problem is that each year's testing takes place with a different group of students, and the results depend on the collection of kids being compared. If your students last year were an atypical collection of gifted girls and boys and this year's crop is a more typical mix, then you can expect your year-to-year results to show a decline, regardless of your abilities as an instructor. The simple little model of pre-assessment and postassessment comparison displayed in Figure 1.2 is the most fundamental way teachers can judge their own teaching skill. A pretest gets a fix on students' status before instruction (at the start of school year, say) and a post-test measures the same students' status again, once instruction is complete (at the end of the school year). As you can see from the figure, the heart of this evaluative model is students' test performance. Although a teacher's overall performance should be determined using a variety of evaluative considerations, not just students' test data, one overridingly important factor should be how well the teacher's students have learned what they were supposed to learn. A pretest/post-test evaluative approach (using some refinements that you'll read about in Chapter 11) can contribute meaningfully to how teachers determine their own instructional impact. Okay, we've considered four ways in which testing—the tests themselves and the student results they produce—can help a teacher make better instructional decisions. The rest of this book will provide you with sufficient information about these and other ways of using assessment in your own classes to make your instructional decisions more defensible. Recognize that students' overt responses to educational tests allow teachers to make inferences about students' covert status. Use tests to exemplify—and, thus, clarify—fuzzy statements of curricular aims. Pre-assess any new group of students to identify those students' entry status. Also pre-assess students when they'll be encountering new skills and knowledge to be learned. Use test results to determine how much instruction on a given topic your students need. Include the data generated by educational tests in evaluations of your own instructional effectiveness.